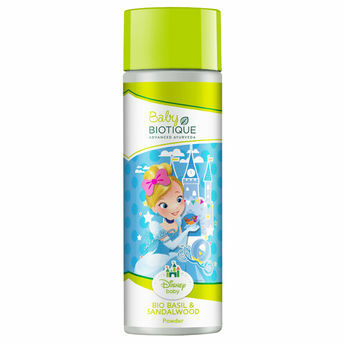 This cooling, caressing powder is a blend of pure basil, margosa, Indian corn and red sandalwood, to keep baby's body dry, soft and free from nappy rash. Absorbs wetness and freshens baby's skin for a silky-soft feeling all over. Basil originated in India and, for centuries, has been the beloved herb known for its curative, culinary and aromatic powers. Its anti-bacterial, anti-microbial nature offers soothing and uplifting effects to heal and refresh both the skin and senses. AND Sandalwood comes from the sandal tree, native to India, and used through the ages for its soothing, pampering, protecting properties. It provides a significant natural defense against UV radiation.